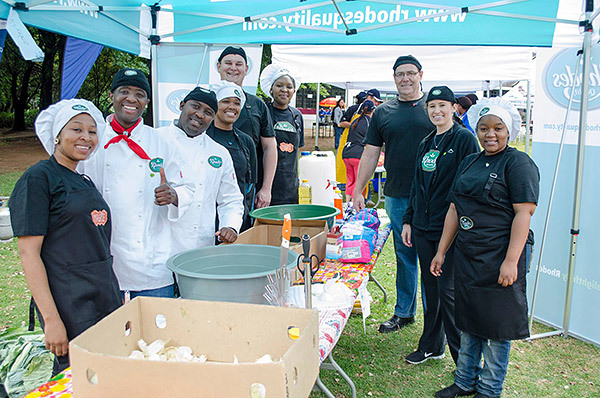 Last year our Ready Meals team took part in the Meals on Wheels annual cook-off on Gillooly’s Farm in Bedfordview and helped prepare 10 000 hot nourishing meals for elderly South Africans. Rhodes Food Group, a long-time supporter of Meals on Wheels through its donations of canned food, entered a team of nine employees who were required to chop, peel, spice, cook and deliver meals to the less fortunate senior citizens in Pretoria, Vaal Triangle Jhb CBD, East, West and South Rand. “We are pleased to be able to bring a smile to those less fortunate by participating in such a heart-warming project. Meals on Wheels do such amazing work to uplift local communities; it was a privilege to be involved,” said Ready Meals General Manager, Dominique Nelissen.